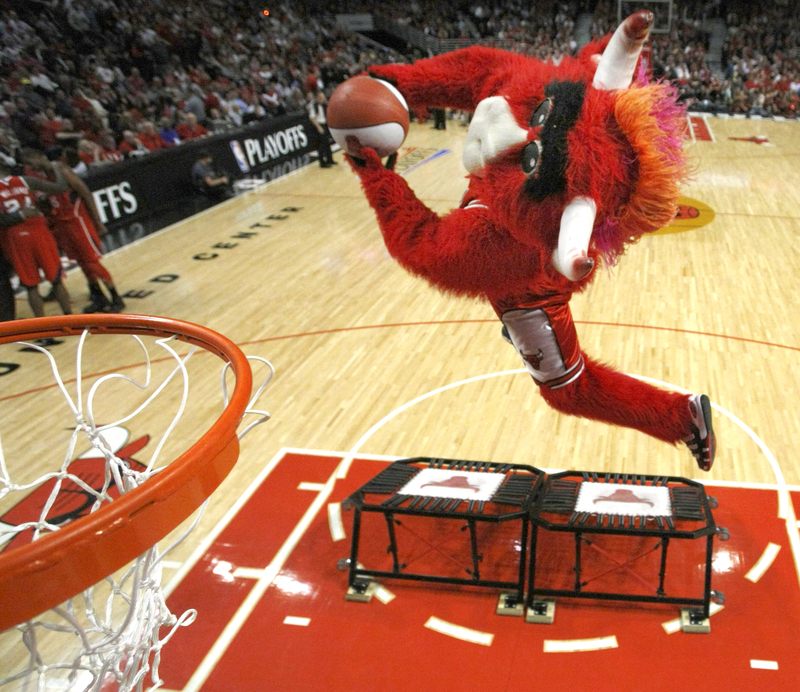 A dunk from Benny the Bull, the Chicago team's mascot. Apparently last night was Benny&apos;s birthday, and all the ticket takers and Luv-A-Bulls were wearing birthday hats in his honor. Benny fraternizes with the mascots of other teams. A coyote, a wolf and a few other forgettable fuzzy mascots were in attendance for his big day. They rappelled down from the ceiling, which seemed very dangerous. During the halftime entetainment, when he competed against his other mascots, Benny broke the rules, which did not seem very sportsmanlike. Benny dumped several giant bags of popcorn on a lady’s head. Benny is a bit of a pervert. During our time at the game, Benny violently made out with a Luv-A-Bull, absconded with a fan on his back, and, on the Jumbo-Tron, flashed from behind a raincoat one of the Wizards who was making a free throw. Make no mistake about it, this was all highly entertaining but at the same time, it makes me wonder about how Staley and Southpaw will attempt to keep up with these shenanigans in the future. I hope we don&apos;t have any Britney Spears-type mascot meltdowns in the future.